Have you just noticed some cracks in your house? I’ll bet you’re worried. Why did they appear? How do you fix the cracks? and can repair the damage. So don’t be afraid to schedule an inspection of cracks or damage with a structural engineer. An engineer experienced in diagnosing and fixing damage in buildings can offer invaluable advice and get you on the road towards satisfactory building performance. If you think your building is unstable – stay clear of the area and arrange for a qualified and registered builder to stabilise the area straight away. Then arrange for an inspection by an experienced structural engineer to design and document a permanent solution. Depending on the nature of the damage, I sometimes recommend monitoring the damage. how wide the cracks are. Write a new entry every couple of weeks or when you notice new damage. “No change” is as important as “some change”, so write it down! Here is the link to our handy crack monitoring kit that might help you keep track of the cracks in your house. Take photos! Digital photos are time stamped so photos and the diary should correspond if possible. This is an excellent example of a monitoring photo. 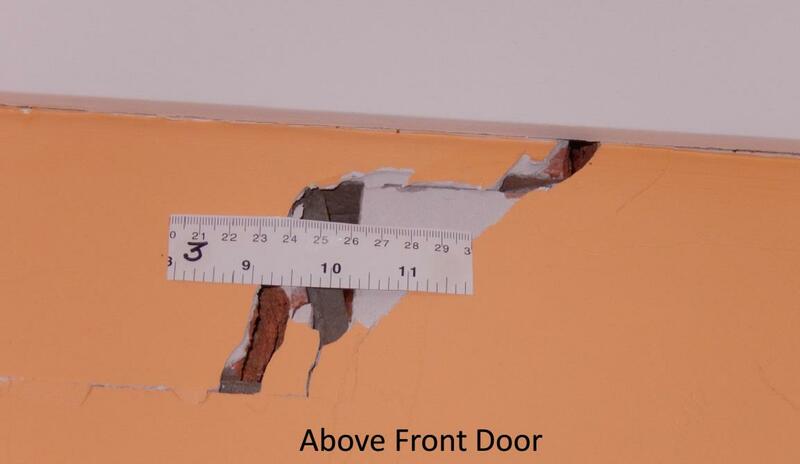 It clearly shows the crack and a piece of photocopied ruler has been bluetacked to the wall to help monitor the width of the crack. An excellent example of how to monitor a crack in a house. You can make your own using material from around the house. See how to make your own water level. Rolling a marble on the floor will tell you a little bit but it won’t work on carpet. That’s why a water level is better. 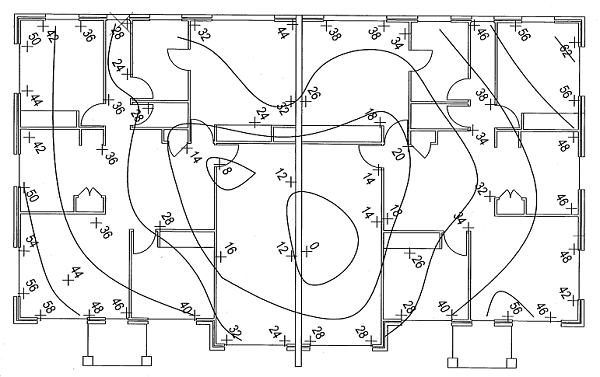 Contour plans help structural engineers diagnose the cause of movement and damage in a house. The process is a quite complicated so you will need an engineer for this part. Get the damage checked out by a structural engineer. Do this BEFORE you decide to sell your house and BEFORE a building and pest inspection and if there a signs of collapse BEFORE any part if the structure actually starts to fail. Why is My House Cracked? If the house is within the statutory warranty period, you might be covered by the builder’s insurance policy. The age of the house also tells me a little bit about the type of construction to expect, and puts into perspective the age of the damage. A 10 year old house and a 10 year old crack that hasn’t changed in 10 years is a different scenario to a 3 year old house and a 1 year old crack that is developing rapidly. Did the damage occur as the result of an insurable event? If yes or maybe, refer the damage to your insurance company. See Lodge a Claim below. Don’t forget to stay clear of any unstable areas. Your insurance company may arrange a temporary ‘make safe’ visit by a builder. Is your house single storey? Is it double storey? Is it on a concrete slab or is it on pole footings? Is it brick veneer or concrete block or is it timber frame? Is the roof tiles or metal sheet or something else? This tells me about the type of the construction but also starts to give clues on what could be causing the damage. Cracks in houses rarely just happen. Is there a new retaining wall near the house? Has the building flooded recently (see Building Insurance below). Has the structure been changed recently? Have you planted or removed trees or shrubs recently? I’m looking for clues as to the cause of the damage. A recent change might give me ideas on how to solve the problem. If I can’t link the house damage to a recent change or an insurable event, I will suggest you get your house pipes checked by a qualified plumber. Leaks in pipes can cause a lot of damage to houses. Engage a plumber to check the integrity of your sewer, storm water and water supply pipes. Use a plumber with a drain camera if possible because a camera is a quick, easy way to identify the location of a leak. However to be certain there are no ‘invisible’ breaks, ask the plumber to flood your pipes and check to see if the water level drops (also called hydrostatic testing). Get any damage repaired immediately! Take me for a walk around the house. Show me where the damage first appeared and how it progressed. I’ll only need 10 minutes of your time, but where the damage started is critical in helping me identify the cause of the damage. I take photos of the outside 4 elevations of the house first – before I forget. I use these photos to confirm the locations of crack photos later. I start at the front left hand corner of the house and work around the outside of the house in a clockwise direction. I record the location, width and nature of any damage I see. I take a photo of any ‘good’ size cracks for the report. I record sources of uneven soil moisture around the outside of the house including poor drainage, dripping taps, gardens located against the building and hot water systems that discharge water against the footing. I use a digital water level to record the floor level in each room. Levels are taken in easily reproducible locations such as at door ways and beside windows. That way we can compare levels in the coming months to determine if the slab levels are getting better or getting worse. Slab heave – uneven movement of the house foundations caused by changes in soil moisture conditions. This damage is often identified as diagonal cracks starting at doors and windows, doors and windows uneven in frames, gaps under internal walls, broken cornices. Consolidation of soft soils – downward movement of the house slab and footings one to two years after the house was constructed. This damage is sometimes caused by soft or loose soil becoming more compact under the weight of a house. Sometimes this damage is related to poorly compacted backfill over council sewer pipes and other underground infrastructure. Slope failure – instability caused by building too close to a slope without sufficient footing protection or footing depth. Poor workmanship – not as common a fault, but sometimes the plasterboard hasn’t been properly nailed or back blocked. This damage is often characterised by seemingly unrelated straight cracks in plasterboard ceilings or walls which follow plasterboard joints. The direction of the cracks helps me work out which part of your building is moving and which part isn’t. If the whole house was moving uniformly, you probably wouldn’t have any cracks! I also ask if you have your crack diary. An inspection of a crack at a single point in time can only be used to deduce a limited amount of information. If you are paying for a structural engineer, you may as well get some bang for your buck. Lots of information is required to solve the problem of cracks in houses. The more you can tell me about the history of the crack the better! Historical photos of your allotment from Google Earth. The dial before you dig report for your allotment. Results of the plumbing test that you commissioned. Original footing and slab plan. Independent new soil test to current standards with soil moisture contents at 500mm centres. Photos of cracks from your crack diary. Bureau of Meteorology rainfall reports at the time your house was built. If the damage doesn’t indicate impending structural collapse and the cracks aren’t very wide and you have only just noticed them I might recommend more monitoring. Otherwise my report includes my assessment of the severity of the damage, my opinion on the cause of the damage, and my opinion on how to solve the problem. Note that I use the term “opinion”. An inspection by an engineer can only tell so much. Much of the building is covered with cladding (the structure) and dirt (the footings). So I am using clues and EXPERIENCE to solve problems and provide solutions. But I can’t see through walls. Can you? I have inspected many houses and repaired lots of damage, and occasionally homeowners place a higher priority on a beautiful gardens against the house, or extra green grass or a large tree than repairing damage in a house. That’s fine. The next owner of your property could still find the report useful! The most cost effective solution to cracks in houses is to find the cause of the damage, remove the cause and watch the cracks close up by themselves. No expensive chemicals. No extra footings. Just some minor repairs when the building stops moving. Regardless of the age of the building or the age of the crack, if you’re in a rush and you decide not to ‘solve the problem’ before fixing the damage please DO NOT repair any cracks in your house or allow your builder to repair any damage without first taking photos and recording the locations of the cracks. If you haven’t solved the problem before patching the cracks new cracks WILL occur. When they do, and if you engage a structural engineer at this stage, they will want to see the original damage as well as the new damage. Is your house still within the builder’s statutory warranty period? Even if the builder no longer builds or the company has collapsed this is relevant. Statutory insurance can be used to solve the problems and repair the damage. If the age of the house is getting close to the warranty expiring, act BEFORE it expires. Lodging an insurance claim with the statutory insurance provider gets you on their books before the expiration of the policy. In Queensland this is the Queensland Building and Construction Commission. The QBCC has a strict procedure that you need to follow and normally it involves working with your original builder first where possible. Keep the lines of communication open. Be honest and as friendly as possible. Nobody likes cracks in houses and it can be a very stressful time for homeowners. so try to limit the stress by working with the people that can help you wherever you can. If the house is outside the statutory warranty period, you still might be covered by your building insurance. Is the damage linked to an ‘insurable event’? If you had a burst pipe or an accidental impact or flood water through your house then the repair of the damage might be covered. Note that the CAUSE of the damage won’t be covered. You have to fix the burst pipe yourself. Each insurance policy is different, so read your policy before you make a claim. Knowing your rights is the best way to ensure you receive a fair go when fixing cracks in your house. Wonderful tips. I like the idea of “Start a Crack Diary”. Thanks for sharing! 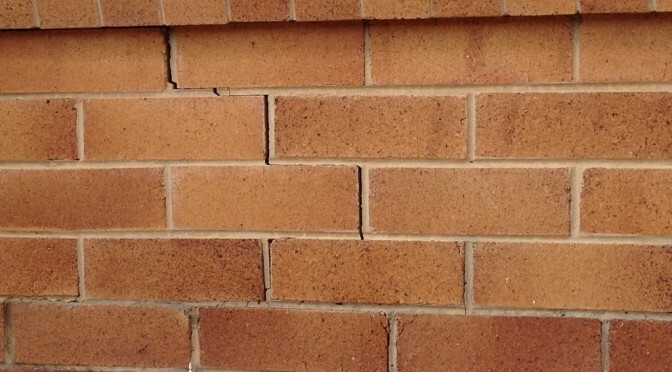 Thank y9ou so much for mentioning how you should take the time to schedule an appointment with a structural engineer when the bricks in your house get cracked. I can understand that doing this can help you get proper repairs and make sure your cracks do not affect the rest of your house. It is important to remember that in order to find a reputable contractor to help you much compare several of them and read reviews from their previous clients to make sure they are reputable. it is important to note this guy doesnt rely on chemical injections first. many different approaches…some are better than others. We have had a person out to look down our drain and saw new pipes there but we have cracks that we’re 20 mm now they are one and a half inches all around the laundry area. Notify realestate and said they willlook into it but has not gotten back to us about this issue. This is dangous,what can we do. We are having big spiders coming through the cracks and there bodies arethe size of two 50cent pieces and it scares the hell out of my mother. Can anyone assistant and know someone that can help us with us. I know that we need to get an inspector to look over the house. We are in a fixed lease. This is a very informative article. Thank you for sharing this guide. We just moved into a two-storey rental house, and I noticed some cracks on the cement walls near the stairs. There are also some cracks on the second floor. Our landlord said it’s just the paint, but I’m not sure I should trust him. The property isn’t due for an inspection in 4 months, but I’m thinking of getting our own home inspector check the house out. Nevertheless, I’m definitely going to start a crack diary right now. The DIY water level is also a great tip. Again, thanks so much for all these details. I look forward to reading more of your posts. Hi, we are living 6 feet from a 154 room 4 storey retirement village construction site – they had to piledrive down to build a 75 car basement. We had 2 Dilapidation Reports done on our house (they did one and so did we). Both concur – there were “no cracks” internally upstairs at all. They started cement pulverising 6 feet from our property – 2-3 very intense 10+ hour days until l complained and they amended the way they were working (short sharp bursts instead of continuous earthquake bursts). It was like an earthquake for 2-3 days. I have video of our house shaking. Then weeks and weeks more (video of it all) of less violent shaking. Now cracks everywhere upstairs – most at the corners of windows and doors – one small hairline crack in the plaster. Have had 7 meetings and the builder and their engineer says no way the demolition caused the cracks – it’s coincidence – the house was going to crack this year – after 22 years crack free – or it was the wind!! I have a diary of everything and copious photos of before and now. My dilemma, the cost to fix it is probably $1-2K. I am assuming an Engineer report is way more. But these guys have bullied me (5-6 guys turn up to meet with 1 x 62 yo woman!!) and l don’t want them to get away with it. Do l pay for an Engineer report and if they say its “coincidence” too then l’m up for that cost “plus” the repair. What is said in here http://vibrationdamage.com sooooo relates to my position. None of them are being truthful! Exactly what the vibrationdamage report says they will be! This was excellent information for me. I have been noticing major cracks in my third story home. The cracks are widening and my hard wood floors seem to be buckling on that level as well. Over the past year I have noticed this progression. Thanks for your detailed info. I need to find a structural engineer in the Philadelphia area. Be blessed and thanks for helping people. It appears that you have a caring heart and spirit. I like your tip to start a crack diary. I often forget where and when I see any problems with my home and it make it hard to determine when a problem is serious. I think writing it down is a great idea because it can be a reference for you and any contractors you may hire. Great tip!